3.What is the Difference b/w Function overloading and overriding? 4.Differentiate b/w Declaration and definition? 11.Differentiate b/w Class and Structure? 15.What is public and private section? 19.Difference b/w virtual class and friend class? 21.What is scope resolution operator? 22.Difference b/w Java and C++? 23.Write a program to print table of 5? 24.Types to initialize the variables? 25.Write a program of multilevel Inheritance? 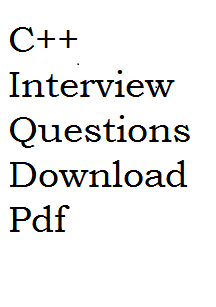 Thanks for highlighting this and indicating about C++ Interview Questions|Questions for Interview|C++ Questions|Infosys Interview Questions where more study and thought is necessary. in 16 bit DOS programming , keep() is used to resident a program in memory, but in 32 bit / 64 bit C compiler, how can I use this?If keep() does not work, then what is the alternative function that works?